Mark it on your calendar! 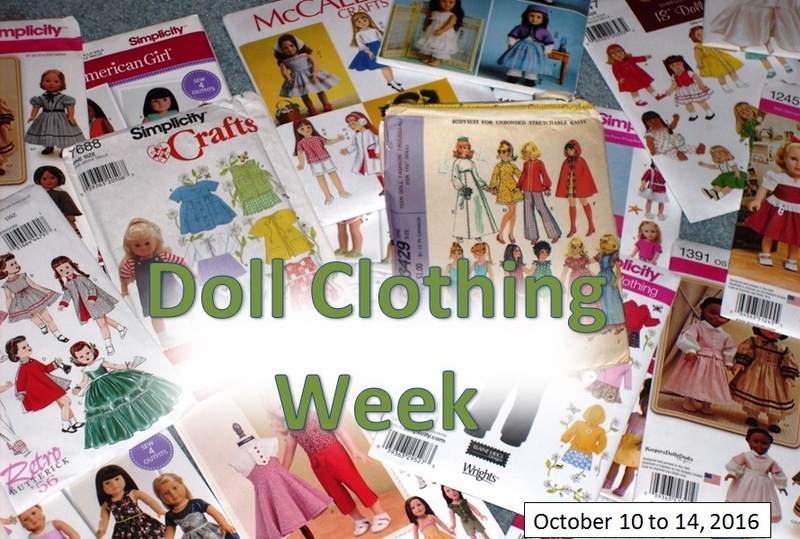 The first ever Doll Clothing Week is coming October 10 to October 14th, 2016. Right now, I am in the process of lining up a few giveaways and a blog hop. If you would like to participate in the blog hop please let me know. Remember as doll clothing week, any doll will work, not just American Girl 18″ style dolls. There will also be a Facebook group page so those without a blog will be able to share their creations with the rest. So I finally made another Queen Elite bra from my class kit I got last year. I made the same size as in the class a 37F. However, this time I added an eighth of an inch on the center back (for a total of a quarter inch). I did not make any changes to the length of elastics. That definitely help the bra feel better. My class one was just a touch too tight that it left red marks when I took it off. This time, I decided to pre-stretch the channeling before applying it to the bra cups seam allowances. It really helped me apply the channeling easier. Probably not recommended but it gave me one item to focus my attention on at the time and that was stitching closely to the edge in the cup seam allowance. I did pick up the new sizes of the Orange Lingerie Marlborough bra but I am not ready to try out a new pattern quite yet. Last night, I did get four purses for the Sew Powerful Purse project cut out along with a skirt and my August murder mystery quilt block. My mother absolutely adores doilies. 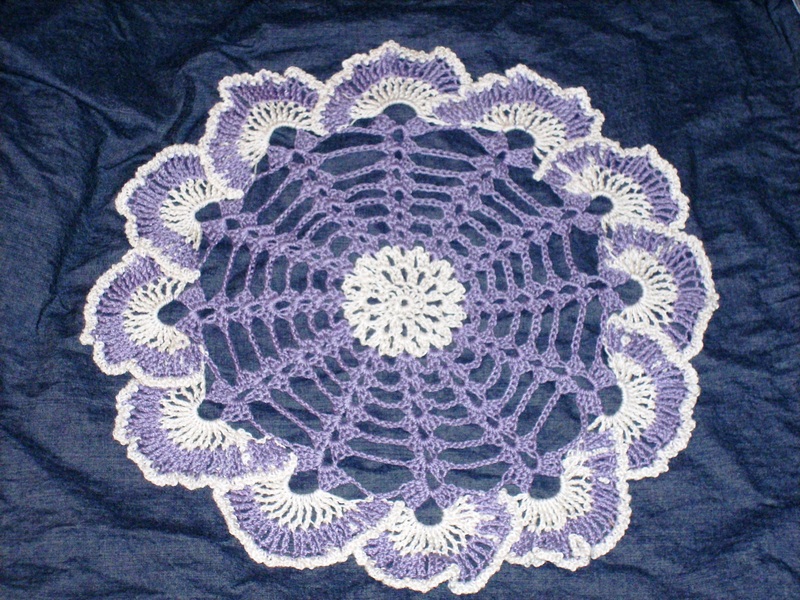 In fact, she said the best Christmas present my grandmother ever gave her was a set of three hand crocheted doilies. 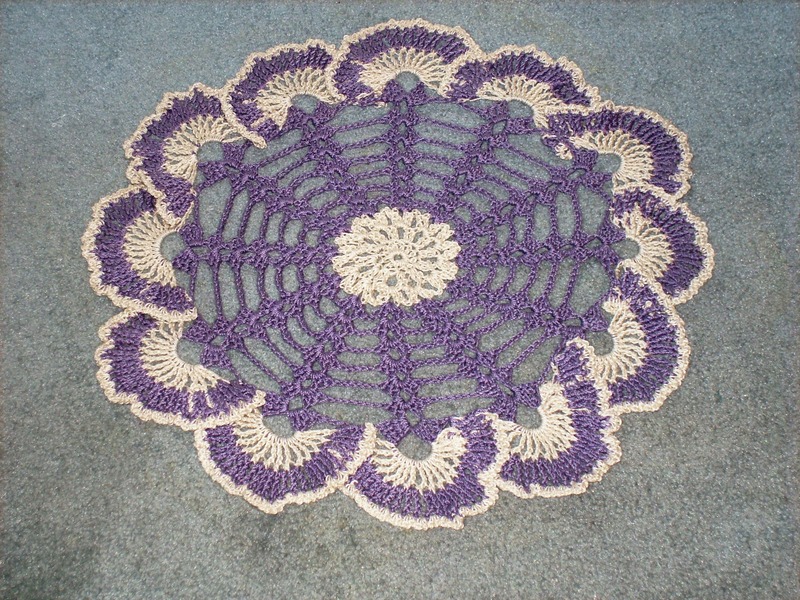 Actually the Sea Shell Ruffle doily is the third doily I have made. For it I used Aunt Lydia’s Fashion 3 in Plum and Ecru. I used a size H hook. This doily took a whole ball of the purple thread. This took a couple of tries to get started. Most of that is just lack of experience. After that, the pattern was pretty easy to follow except for the final row. I didn’t quite understand what was going on from reading the instructions. So I made up a pattern and kept it up through the whole round as the final border. I made sure to note it down on a post it note and put inside the book. Next doily will be A-792 Brocade from a Coats & Clark book (1969) for my bedroom dresser.